Royal Canin is a well known pet food manufacturer. 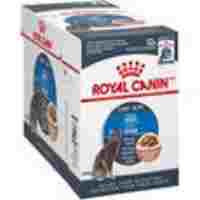 The Royal Canin Ultra Light Chunks in Gravy Adult Cat Food Pouches is just one of their wide variety of flavors and special needs diversity. They also make prescription diets for pets with certain diseases. These diets must be prescribed by a Veterinarian. Cats are obligate carnivores. Therefore, I look first for the type and amount of meat in the food. When you look at an ingredient list, you should know, ingredients are listed in order of quantity. The first ingredient is the main ingredient by volume. Ingredients further down the list have progressively smaller and smaller amounts. When I look at Royal Canin Ultra Light Chunks in Gravy Adult Cat Food Pouches ingredient list, I see the first ingredient is water. Water is necessary for processing as well as beneficial for cats that typically drink little on their own. Next comes Chicken By-Products and Pork By-Products. For those that don’t know By-Products are the leftovers of meat processing. It can include scraps of meat, beaks, feet, hooves, skin, etc. For this reason the nutritional value can vary greatly. Many of these ingredients are not digested by your pet. I see that Pork Liver is third on the list. Liver has a lot of nutritional value, but its high fat content can cause trouble if too much is fed too often. I trust that Royal Canin has this in the proper proportions. The lack of actual meat is of concern to me. Carnivores thrive on meat. I want my cats to thrive not just survive so I would not want my cats on this diet long-term. Wheat Gluten is another worry for pets with food allergies. Gluten is high on the list of allergens for pets. It is a great binding agent and therefore it is used often. Vitamins and minerals are added to assure the diet is balanced and meets at least the minimum daily requirements. I tried this food because one of my cats is overweight. In a multi-cat household like mine, it is not easy to control portions. Sometimes I have to feed and leave. Looks like I need to implement feeding stations by calorie count! I cannot truly evaluate the weight maintenance of this food because it is too hard to get my skinny and sick cats to eat their food when they know others get this! For taste this food wins hands down! All my cats love it. I also have some tiny and or ill cats that need high calorie foods. Unfortunately they prefer this food! Their pouches are very easy to open so if you have dexterity problems that is a big plus. Who doesn’t think about cost these days. This pet food is on the higher end. With the lack of quality ingredients, I would have to say you don’t get much value for your dollar. I received this product for free from Chewy.com in exchange for my hones review. Although this product does not meet my needs it may suit yours. I do not receive commission for sales of this item. Here is a link for your connivence. Please share your experience with this product or any comments and questions below.